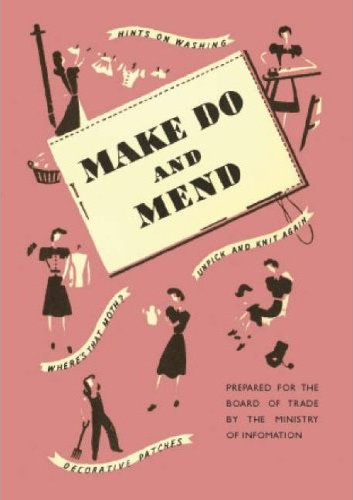 A ‘make do and mend’ poster, c.1942. The Second World War permanently altered Britain’s relationship with the rest of the globe. Before 1939 the empire, particularly India and the settler colonies, dominated Britons’ conceptions of international affairs. But nearly six years of global conflict incontrovertibly changed this mindset. 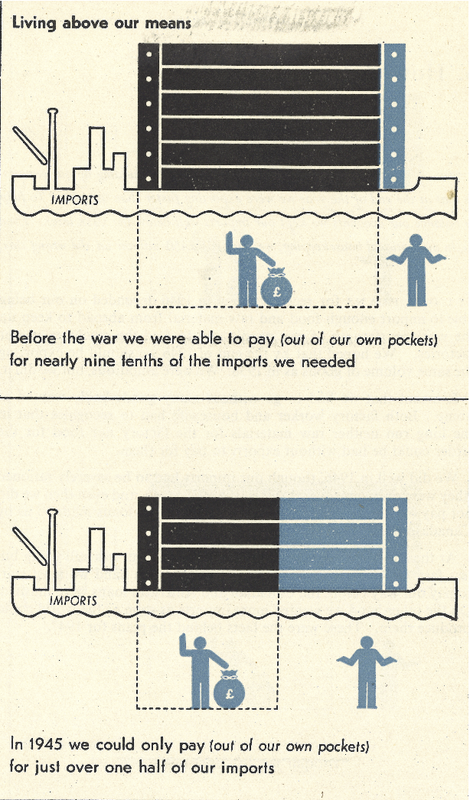 Isolated from its dominions by Axis submarines, ‘austerity’ Britain quickly adopted severe rationing and a ‘make do and mend’ approach. Gardening, raising small animals, and comprehensive recycling and reusing of countless household items became part-and-parcel of daily life. The British government and various civil organisations promoted the ‘local’, not the ‘global’ (to borrow sociologists George Ritzer’s and Roland Robinson’s terminology), prioritising national entrepreneurship and ingenuity over importing and exporting of goods. This radically – and painfully – changed after 1945. India and Pakistan’s independence in 1947 catalyzed the empire’s irreversible (but relatively ordered) disintegration. The United States and the Soviet Union emerged as fierce economic competitors, with considerably greater physical resource assets. At home, voters ousted Winston Churchill in favour of Labour Party leader Clement Atlee, who promised to refocus government policies on domestic social welfare. Internationally, Britain was forced to contend with a radically-changing marketplace. By the 1950s, it was increasingly evident that it could no longer solely rely on domestic production and inter-Commonwealth trade to both satisfy consumer demand and maintain the state’s strong international profile. In ‘Fill the ships and we shall fill the shops: the making of geographies of manufacturing’, Thomas Birtchnell (University of Wollongong) skillfully demonstrates how – in short order – the Board of Trade, private businesses, and public organisations sought to re-educate consumers and producers alike of the global marketplace. They widely circulated such advertisements as ‘how can cycles sent to Africa fetch us cotton from U.S.A.?’ (1947) (p. 437). Officials popularised a “container-ship culture” in schools, trade and commercial magazines, and businesses in an effort to ramp up exports and imports of both raw materials and finished goods. Birtchnell recalled how social economist Karl Polanyi’s 1944 study, The Great Transformation, was trumpeted to promote Britain’s long history of international trade alongside other ‘economic propaganda’ campaigns (pp. 437-438). To accomplish this goal, the Board of Trade and its allies tapped into a culture of consumerism and luxury that had persisted despite the war’s enormous pressures. At partial odds with Guy de la Bédoyère’s 2005 study The Home Front, Birtchnell proposes that Britons were at first exorted to produce and export advanced luxury items (e.g. radios, clothing, automobiles) in exchange for essentials. But this found little favour with British audiences, who had quietly clamoured for higher-end goods during the war, and now demanded their availability in the post-war environment. From 1947 the language changed: the Board of Trade instead promoted the export of British goods in exchange for foreign luxuries – silks, perfumes, electronics, foodstuffs. Such historians as Llewellyn Woodward promoted this programme via their writings; in 1947 he pronounced that ‘An English housewife finds it odd that English china to match a tea-set shattered in the Blitz can be bought in New York but is not on sale in London’ (p. 439). Birtchnell’s study is a fascinating contribution to our knowledge of Britain’s immediate post-war recovery, and hints as well at how Britain’s manufacturing base gradually switched from mass production to luxury, bespoke goods. Thomas Birtchnell 2013 Fill the ships and we shall fill the shops: the making of geographies of manufacturing, Area 45.4: 436-42. George Ritzer 2004 The Globalization of Nothing (Thousand Oaks, CA and London: Pine Forge Press). Llewellyn Woodward 1947 Middle England, Foreign Affairs 25.3, 378-87. This entry was posted in Area and tagged austerity, Board of Trade, British Empire, Clement Atlee, Commonwealth, Cultural Geography, Development, Economic Geography, George Ritzer, Global, Global Issues, globalisation, glocalisation, Guy de la Bédoyère, Karl Polanyi, local, London, luxury, Make do and mend, New York, Political Geography, Rationing, recycling, Roland Robinson, Second World War, Settler Colonies, Shock, Social Geography, The Great Transformation, Thomas Birtchnell, University of Wollongong, Welfare, World War II on November 26, 2013 by Benjamin Sacks. HM the Prince of Wales and French President Nicolas Sarkozy lay a wreath at the monument to King George VI and Queen Elizabeth, the Queen Mother (18 June 2010). 18 June 2010 marked the seventieth anniversary of one of the most important radio broadcasts of the twentieth century. On 18 June 1940 Charles de Gaulle, then leader of the French Government-in-Exile, announced on the European arm of the BBC Overseas Service (precursor to the modern World Service), that “the flame of French resistance must not and will not be extinguished”. The Daily Telegraph recalled that de Gaulle’s broadcasts were deemed so inflammatory by the Vichy Government that the Allied French leader was court martialled in absentia and sentenced to death. This week, His Majesty the Prince of Wales accompanied French President Nicholas Sarkozy and his wife, Carla Bruni-Sarkozy in commemorating de Gaulle’s momentous radio address. This anniversary serves as a fitting reminder of the important role radio – particularly shortwave, or world-band radio – played in the development of twentieth century social geography. Indeed, the recognition of radio as an instrument of influencing social opinion and change occurred in the earliest years of international broadcasting. As was suggested in Nation Shall Speak Peace unto Nation, “The development of transmitters capable of broadcasting beyond the confines of regional, disparate cultural groups and national boundaries…presented an innovative medium for the conveyance of socio-economic and political perspectives of nation-state actors on the global stage”. Radio was a dynamic, malleable tour-de-force: warring governments vaulted propaganda at one another, peoples long suppressed found a new voice of survival, and global knowledge ceased to be optional. 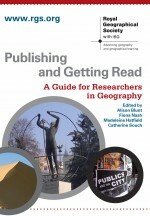 As international radio expanded, so too did a ‘communications generation’; in a 2001 Transactions of the Institute of British Geographers article, Matthew Farish described the years between the world wars as a “golden age’ of foreign correspondence”. International radio continues to captivate and influence. Unfortunately, this can occasionally have dire consequences. On 8 July 1993 Radio Télévision Libre de Mille Collines (RTLM) demanded that Rwanda’s Hutu majority massacre the Tutsi minority. Hundreds of thousands perished. The RTLM episode is a reminder of the continuing influence of radio in the changing social geographic landscape. “Nicolas Sarkozy and Carla Bruni Meet Prince of Wales as they Visit Britain,” The Daily Telegraph, 18 June 2010. Matthew Farish, “Modern Witnesses: Foreign Correspondents, Geopolitical Vision, and the First World War,” Transactions of the Institute of British Geographers 26 (2001): pp. 273-287. Benjamin J. Sacks, “Nation Shall Speak Peace unto Nation: International Broadcasting in the Context of Civil Society,” Hemispheres: the Tufts University Journal of International Affairs 30 (2007): pp. 152-155. RNW English Section, “Hate Radio: Rwanda,” Radio Nederland Wereldomroep, 2 April 2004. This entry was posted in Transactions of the Institute of British Geographers and tagged Britain, broadcasting, Charles de Gaulle, Citizenship, Cultural Geography, Culture, Daily Telegraph, Europe, France, geography, Geopolitics, Germany, Global Issues, media, Political Geography, politics, Propaganda, Radio, Rwanda, Second World War, Shortwave, Social Geography, United Kingdom on June 18, 2010 by Benjamin Sacks.